Hello I'm trying to set up an Aquaero and am having trouble figuring out how to hook up everything for what I want it to do. A quick side note, finding practical solutions anywhere online is surprisingly tough. Anyways, quick not about my system. It is a dual loop. 1 for CPU, 1 for GPU. 4 fans for each rad. - Have 4 sets of fans controlled by independent channels. 4 on CPU rad. 4 on GPU rad. 2 case fans. 3 more case fans (in different chamber of the case). - Have 2 pumps controlled independently. - Have 2 flow meters feeding back info. 1 for each loop. My initial thoughs were to have each of the fans split in each channel. Use a split cable for the flow meters. Use the PWM outputs for the pumps. I attached an image to illustrate what I think is the solution. Is this correct? If not how can I set this up properly? Thanks! You cannot 'Y' the flow sensors together. They do not have identifying addresses and would confuse the aquaero. BUT, on the new aquaeros, the aquabus 'low' port is also a flow input port, so you can connect both sensors directly. The two 'PWM' ports you have the pumps connected to will not work for you. Those ports are more for driving a dimable, single color LED strip. If use the four on the aquaero for the pumps and rad fans, you could get a QUADRO with 4 additional PWM fan ports for the case fans. A few things to fix some of the issues I see with this config. 1. Make the loop all one loop. No point in spending extra funds on pointless separate loops because the temps will be close to the same. You might get a few degrees knocked but completely not worth the trouble and extra funds spend. 2. Combine all the rad fans on a SPLITTY9 and use that to control off of one PWM AQ Channel. As long as you're within spec (30W/2.5A), you should be fine. 3. You now have an extra PWM channel where you can use something like this to combine the pumps (Need to be identical pumps) in Serial configuration meaning they'll have their own top together and increase their pumping power for your one big loop and also give you redundancy, say if one should fail the other would keep the flow going if you were away from the PC. - PWM CH. 1 - PWM Pump signal combined via 2 pumps with a PWM Cable plugged in while the pumps are getting their own power from the PSU. - PWM CH. 2 - SPLITTY9']SPLITTY9 housing all your rad fans because why would you split their speeds up to different speeds? Air flow will become turbulent. Keeping them all in the same speed is ideal. - PWM CH. 4 - Case Fans (Or you could combine all case fans to one channel and leave you one PWM channel for use. Now since you're one big loop, you only need one flow meter as you can't combine flow meters together. It needs to be seen and read on its own. This is how my AQ6 is setup. Would just use a standard 4-pin PWM connector to connector to connect to the "low" port. What is the proper pin out for that? With the QUADRO will I still have 6 distinct different channels to control everything separately? (2 spearate PWM pump channels, 4 separate PWM fan channels) I assume from there I can use a standard splitter as long as those fans are on the same channel. Not sure how important is is to mention but my pumps are D5 ekwb pumps. 1. Dont connect PWM Controlled Device to PWM 1/2 (you EK Pumps), you destroy your Devices when you use this connector. 2. Connect one flow Sensor to Flow, the other to aquabus LOW. NO, a specific cable is required for the high flow sensor G1/4, either 53027 or 53100. The flow sensor connector is not a standard fan connector type plug. If you need to extend, you can use a standard 4-pin PWM cable. 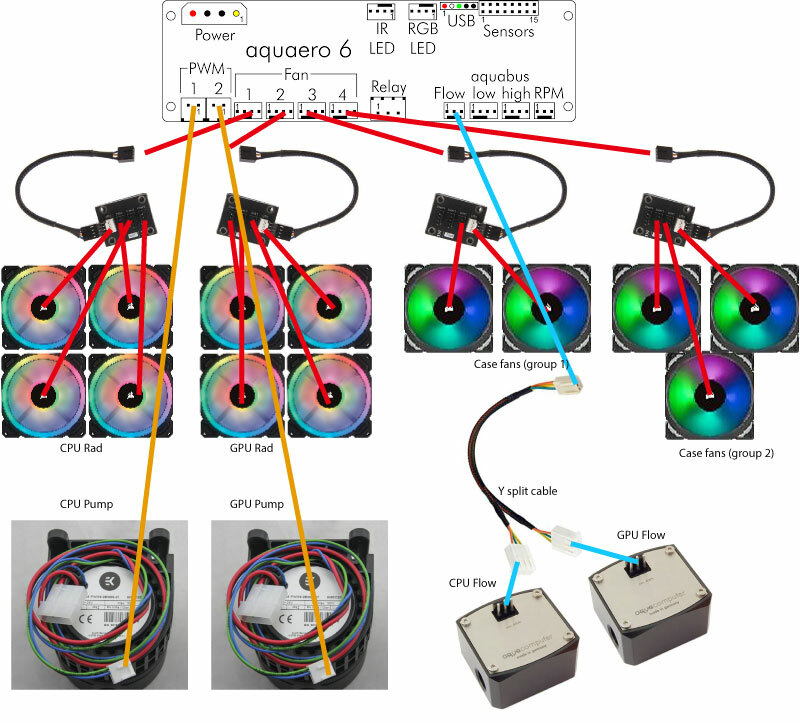 If I followed a recent thread correctly, if you want more than 4 curve controllers you should connect the QUADRO by USB only, and not use the aquabus. Yes, standard PWM splitters will work for the fans. If your EK D5 pumps are the newer PWM G2 version, they should have the correct PWM implementation.